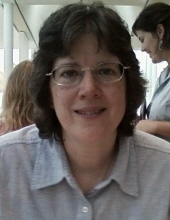 DURHAM: Sandra Barber, 55, passed away on Friday, October 26, 2018 at Duke University Hospital. She was born in Easton, PA to the late Francis Joseph Barber and the surviving Jeanne Cook. Mrs. Barber was the owner of Heartfelt Touch Massage of Durham and Kindred Chocolate. Mrs. Barber is survived by her wife, Hervey Willard Ashe; step-father, Gary Cook; brothers, Michael Barber, Brian Barber; nephews, John Batchelor, Thad Smith, William Batchelor; nieces, Brianne Barber, Maggie Barber. Memorial service arrangements are pending at this time. In lieu of flowers, the family requests that memorial donations be made to American Breast Cancer Foundation. To send flowers or a remembrance gift to the family of Sandra Barber, please visit our Tribute Store. "Email Address" would like to share the life celebration of Sandra Barber. Click on the "link" to go to share a favorite memory or leave a condolence message for the family.